A good pronunciation makes a good communicator. 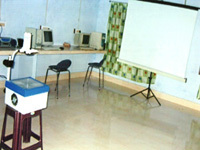 Therefore this College of Education is equipped with a fine language laboratory. Students can perceive the sounds of different phonetic symbols and hear them distinctly. It helps them develop their pronunciation, accent and intonation. Every student has provision to stop, rewind and replay the tape at any time. The students can work at their own place. 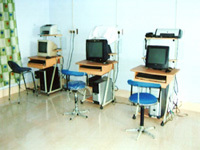 He/ She can select the materials freely and the teacher can listen to individual students without disturbing the others. The teacher can communicate with the students and also control the programme when she/he so desires.